There is one thing our kids know they will always receive on Christmas Eve: a new pair of pajamas. Chances are, your family shares in a similar tradition, whether it’s new pajamas for the kids on Christmas Eve or everyone in the family opening matching pajamas first thing on Christmas morning and then rushing to change into them before any pictures happen. What I love about this tradition is that even though our kids are getting into their teenage years, they still look forward to this family tradition and don’t mind looking a little silly with mom and dad for one day out of the year. Now that they’ve moved out of their younger years where they obsessed over princesses and super heroes, it’s been even more fun to select family pajamas that match, or at least coordinate. However, purchasing matching pajamas for the entire family (especially if you’re involving multiple children, grandparents, or even pets!) can get quite costly. That’s why it’s important to find high quality pajamas you like the look of when they go on sale. 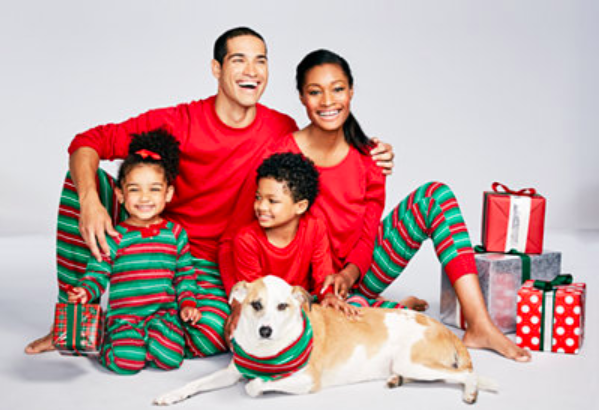 Which brings me to my point: right now you can go to Macys.com for the Family Pajamas Deal of the Day! The best part about this deal is the more sets you buy, the more you save. If you buy one set, you’ll save 50% off, but if you buy two or more, you’ll save 60% off. And remember, right now during the One Day Sale, you only need to spend $25 to qualify for free shipping on Macys.com. And yes, you will even find matching pajamas for your pets, just like pictured in the image above. There isn’t much time left to take advantage of this deal, so start shopping for the best selection at the best prices.